This past April, I had the honor of designing Mason Jar Event Group's SPRING event invitations and menu — and then I even got to attend the event in Denver, Colorado! 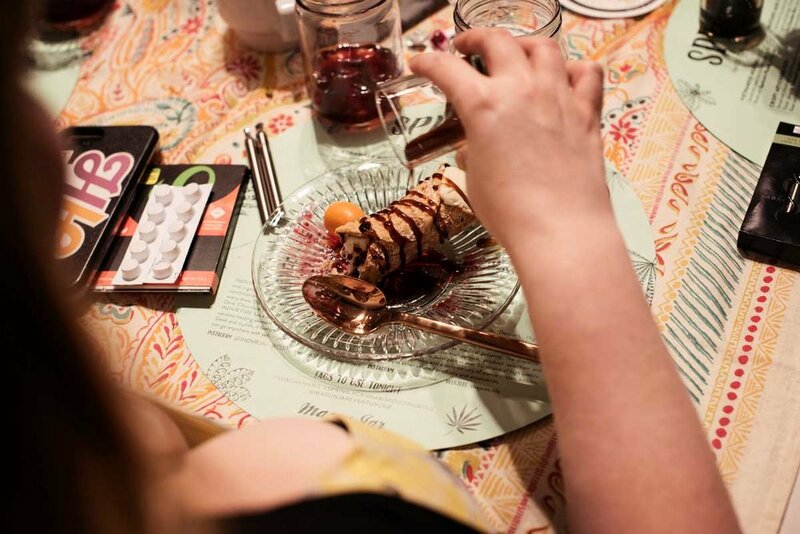 For anyone who may be unfamiliar, Mason Jar hosts upscale cannabis and meal pairing dinners. Before the event begins, attendees pick up a goody bag at the hosting dispensary that contains all the items they'll be pairing for the evening. Each item is thoughtfully paired with a different course of the meal so that guests get the most out of their experience. Served with sweet chili aioli and micro cilantro. Paired with Spectrum’s Phoenix concentrate. Served with shaved aged gouda & balsamic reduction. Paired alongside Silverpeak Apothecary’s Dragon flower and A Land of Hanalei Mocktail. Served with organic greens, Easter egg radish, Ruby-star Grapefruit, English Peas, Asiago cheese & balsamic vinaigrette. Paired alongside INDVR Fire Ruby Red Grapefruit vape pen and a Pomelo In My Punch Mocktail. Served with fig cacao mostarda, potato porcini gratin and asparagus. Paired alongside INDVR Fire Chocolate Mint vape pen and Steepfuze CBD infused Mocktail Du Jour. Served with warm orange caramel sauce and raspberry purée – stir, dissolve and pour The Growing Kitchen’s CBD:THC 10:1 Chill Pill into the warm sauce and on top of the cannoli. Served alongside Steepfuze CBD Infused Mason Jar Blend Coffee and local liqueur. Prepare yourself to be regenerated into a new dimension. Phoenix full-terpene liquid captures unique flavor profiles then is drizzled over our high-terpene crystalline. With the potency of Ambrosia and the rich terpene flavor of Nectar, Phoenix provides a sensation of deep body and mind easing resolve. This product is best enjoyed by “dabbing” off a quartz/titanium/glass nail or in a vape pen and near the twinning terpenes of the locally sourced micro cilantro in Chef Asher’s Vietnamese Meatballs. Silverpeak Apothecary’s Dragon is perfect for social occasions. An energetic, euphoric Sativa that enhances productivity and creates a functional, clear-headed mindset. This party girl keeps it classy all day, and into the night, pairing perfectly with rich, acidic flavors like tonight’s Toasted Artichoke Puff. Also included in your goody bag, Purple Dog Bud, a strain you could smoke every day for the rest of your life. Purple Dog Bud is uplifting yet relaxing, euphoric yet clear headed and just feels like a big ol’ bear hug. Enjoy! These sweet little hard confections combine CBD's phenomenally relaxing non-intoxicating properties with THC's more cerebral effects. 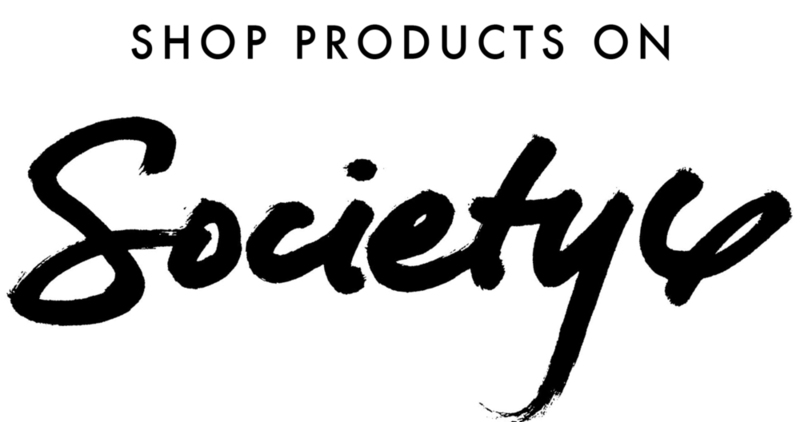 They are infused with TGK’s own farm-grown cannabis, high in CBD, a naturally occurring compound in cannabis renowned for its ability to relieve pain. We love it for use with pain management, inflammation, or insomnia. We suggest dissolving one into tonight’s warm sweet dessert sauce. Straight from Chef Asher’s kitchen to your heart. All in all, this was one of my favorite Mason Jar events to date — second only to Hemp & Seed, because what beats eating dinner outdoors on a beautiful hemp farm?? Check out some more of their past events I've contributed to below! 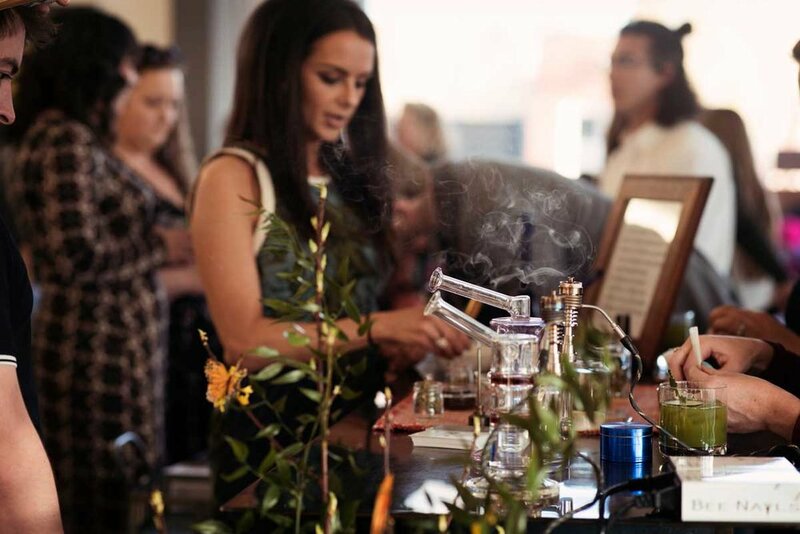 A gallery overview of the luxe WINTER event that brought people of cannabis together for an elegant and elevated experience. 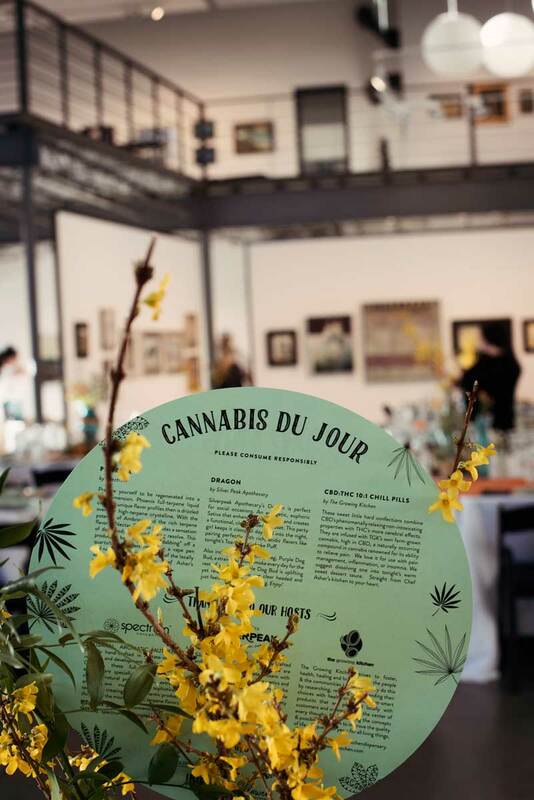 The details of a classy cannabis event.